Special TV offer! Regularly priced at $1,203, now only $1,007. 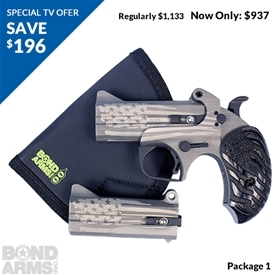 The Smallest, Most Powerful Personal Protection Handgun You Can Carry! FREE Live Secure Document: "How To Buy Your First Handgun"
FREE Booklet: "The Five Basics of Firearm Safety"
Not available in all areas including: MA, Chicago, Detroit, New York City or Washington D.C. and all models may not be available in CA, MD, NY or NJ. Firearm availability subject to change based on state/municipality regulations. * $50 Coupon Applies to orders of $200 or more. Must be sent to a FFL (Federal Firearms License holder). Please add preferred dealer in checkout. FFL Dealer Inquiries Welcome – Please call 817-573-4445 for details. 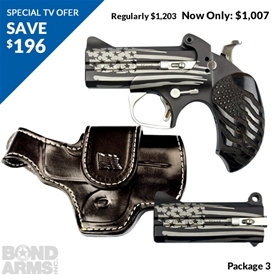 Transfer fee discount is discount off the final price of the firearm to offset the cost of an average dealer transfer fee. Purchaser must be able to pass a NICS Background Check. "I have just recently purchased this weapon and I feel no regret in any form. The weapon lives up to its Texas pride without any hesitation, a true example that in the US we make our weapons correctly. As for function the weapon does not disappoint, we are basically dealing with a ”show stopper” weapon and when it is loaded with 410 ammo you get that service in seconds. I have recently retired form the military and I only wish we had something like this in our kits. I would gladly take this weapon into combat with my sniper rifle. As for the weapon itself the Cowboy Defender is perfectly made; from the polish to the handles I have no complaints. In regards to accuracy the weapon does it’s job but remember you will not be engaging targets at 100+ meters this is a area weapon for those ”oh s**t” moments. So to conclude ... am in love." 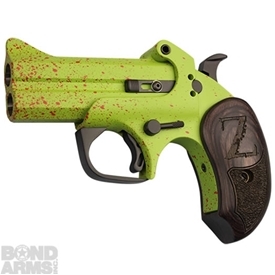 - Miguel C.
"I have a BA Snake Slayer with the BATB holster. I have 3 barrels..the 45/410, the 45 Colt, and the 45 acp. This week, my 44 Special barrel should arrive! I have the original Extended Grips, the Silver Star Rosewood Extended Grips, and my Snake Slayer now proudly wears the Imitation Ivory Extended Grips! I have fired this fine weapon often at my range and am pleased with it’s performance! 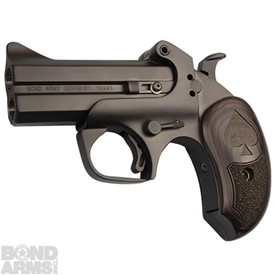 Your firearms are solidly built and flawless in performance and reliability! Your customer service is second to none!"